Eaton Non-reversing definite-purpose control starter has current rating of 25-Amps and voltage rating of 115/230/460/575-Volts. It has a dimension of 3.69-Inch x 2.5-Inch x 7.14-Inch. This starter has coil voltage rating of 110 - 120-Volt AC at 50/60-Hz. It offers electrically isolated 1 NO - 1 NC contact configuration and screw/pressure plate terminal connection. It withstands maximum load capacity of 2 hp at 115-Volts, 3 hp at 230-Volts 1-Phase and 7-1/2 hp at 230-Volts, 10 hp at 460/575-Volts 3-Phase. 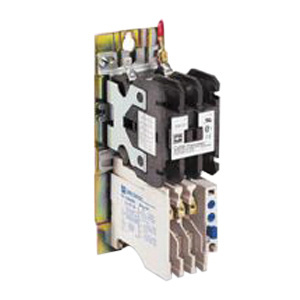 This 3-Phase starter allows user to reset automatically or manual. Shrouded or finger-proof terminals of this starter minimizes electrical shock. Starter with trip-free mechanism, provides overload trip indication. Starter is UL listed and CSA certified.